This systematic approach for documenting and analyzing your customers' experience could prove to be one of your most valuable customer relations tools. One way to differentiate yourself from the competition is to increase your understanding of what your customers experience when they interact with your business. This opens up avenues for making effective improvements and innovations to your services or products. And a powerful tool to boost your understanding of that customer experience is a customer journey map. A customer journey map, also referred to as a customer experience map, is a visual representation of a customer's experience with you over time and across channels. It gives you the ability to see that experience from your customer's viewpoint. A successful customer journey map captures the various stages of the customer experience with your company, and the emotional responses the experience generates. It also identifies potential gaps between what customers need or expect from your business and what you provide. This map is a systematic approach for documenting and analyzing what is usually a fuzzy notion of what the customer experience is truly like. It's akin to walking a mile in your customers' shoes.The ultimate goal of the map is to boost your opportunity to delight your customers and improve their journey with your company. Step One: Identify the "personas" (or types of customers) for whom you want to create journey maps. Step Two: Identify the different stages when a customer interacts with your business. What are the different touch points, from end to end? What different channels do they use at each touch point? Plot each of these across the journey. Step Three: Plot the expectations customers have of your business at each of the touch points in the journey map. Step Four: Identify how your service or product meets these expectations. Are there any gaps? Step Five: Map points in the customer interaction where things sometimes or often go wrong. Describe these roadblocks or forks in the road. Step Six: Document your customers' emotional response at every step of their journey with you. Step Seven: Identify the "moments of truth." These are crucial moments in the customers' journey when they might make a decision about your business, good or bad. Step Eight: Analyze the potential opportunities for customer service improvements. Step Nine: Use the insights you gain to list specific actions you will take to make these improvements and innovate. Personas: Before you start to build your customer journey map, you should be clear about your customer personas. For example, if you're an owner of a small boutique hotel, your ideal or habitual customers may represent three personas: couples, business travelers and people with special needs. When you first get started with customer journey mapping, it helps to limit the number of personas you include in the process. Creating a journey map for too many personas may cause you to lose focus. The Touch Points: The first step in improving your customers' journey happens before they even interact with you. That's the stage when a customer searches for information to answer their needs. This is a crucial stage, as it can make the difference between attracting or losing a potential client. This should, therefore, be the first touch point of concern. For example, a wedding planning entrepreneur knows prospective customers are likely to research various websites of wedding planning companies. What criteria might the customer use to evaluate these sites? They're likely looking to see photographs of weddings the company has planned. Does the website provide a rich array of such photos? Are they of recent weddings? Are they over-the-top luxury events, or more reasonably priced functions? Are there free resources such as planning checklists or budgeters? Prospective clients may also be interested in checking out the company's social media presence to get a feel of the company and the team. Today, 42 percent of online women are Pinterest users. If the prospective client is female, she may be looking to see if the company has Pinterest boards of its wedding planning portfolio. She may also be looking for ideas to inspire her. Armed with these insights, a small-business owner can make some small changes to meet, or even exceed, this customer's need for information and improve the experience before the customer has even met anyone at the company. When evaluating the different touch points in the customer experience, go deep. Be granular in mapping every event from end to end. Even the smallest slivers of interaction count. For example, how long does your team take to answer emails? How many rings before your staff picks up the phone? How frequently do calls go to voice mail? Don't discount the value of instant gratification in customer service, and use the insights you gain from your customer mapping journey to make any necessary changes. Also, don't limit the touch point analysis to communications your customers have with your company. Include physical touch points, such as your parking facility or the cleanliness of your bathrooms. Gaps in Fulfilling Customer Expectations: An analysis of the gaps between a customer's expectations and what you offer not only helps you improve your services, but it can also be an opportunity to up sell. In the previous wedding event planning example, opportunities may range from selling special photo albums to preserve treasured memories, to books on wedding etiquette or a wedding planning app. Derailers in the Customer Experience: When you plot things that go wrong in the customer's journey, analyze the causes for these potential derailers. What can you do to eliminate the customer pain altogether? It's a well-known psychological principle that we do more to avoid pain than to gain pleasure. If you do nothing else to improve your immediate customer service culture, work on eliminating the roadblocks and negative customer experiences. The Customer's Emotional Thermostat: Use every means you can to monitor the client's emotional response to your service or product: direct observation, face-to-face interviews with a customer, feedback questionnaires, online customer satisfaction surveys, Web analytics, online communities, comments on social media, call recordings of customer service staff, support logs or follow-up calls. You can even invite trusted long-term customers to participate in the process of building your customer journey map. Their feedback may be invaluable. The Moments of Truth: The moments of truth might occur at any of the touch points. Be diligent in identifying these, as much depends on them for customer attraction and retention.These can be moments as simple as how a new customer is greeted, or emotionally charged events such as how a customer is treated when there's a complaint. It might be having to deal with annoying roadblocks such as being asked to provide an email address and telephone number to access free resources, or forcing customers to sign up for an account in order to pay. Resources: Depending on the nature of your product and service, the customer journey may be highly complex. It may include a multitude of relevant places where the customer interacts with your company. If this is the case, you can enlist the help of a professional. You can also attend a workshop on customer mapping creation, or use one of the many customer mapping software tools that will help you document customer journeys with different personas, including all touch points and accompanying emotions. There are also apps for creating customer journey maps. Investing some time and effort to understand your customer's journey from beginning to end can pay dividends. A customer's journey map is a powerful ally in your quest to provide exceptional service. In fact, it could be your most important customer relationship tool. 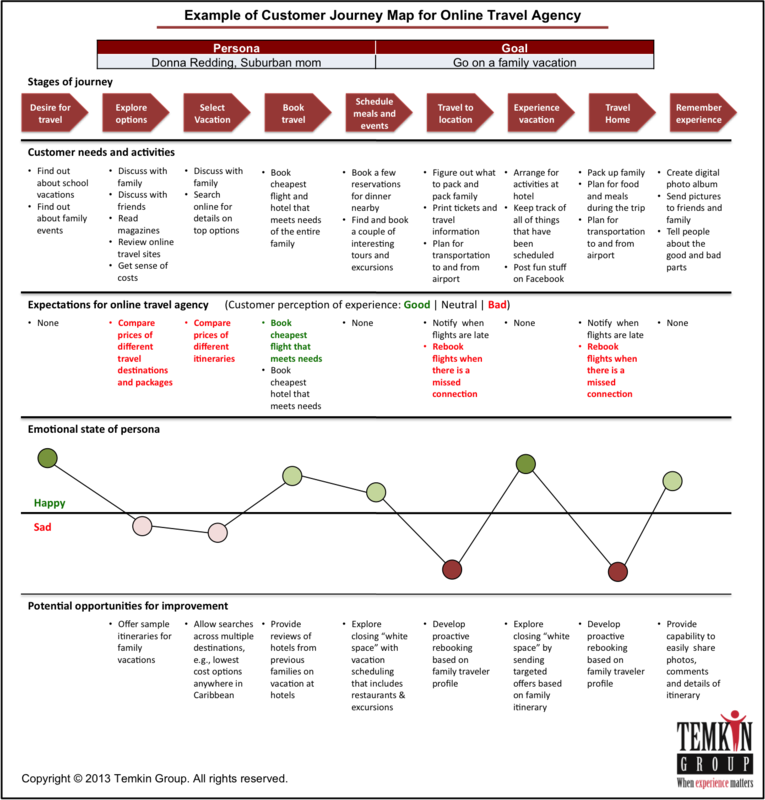 Check out this example of a customer journey map.